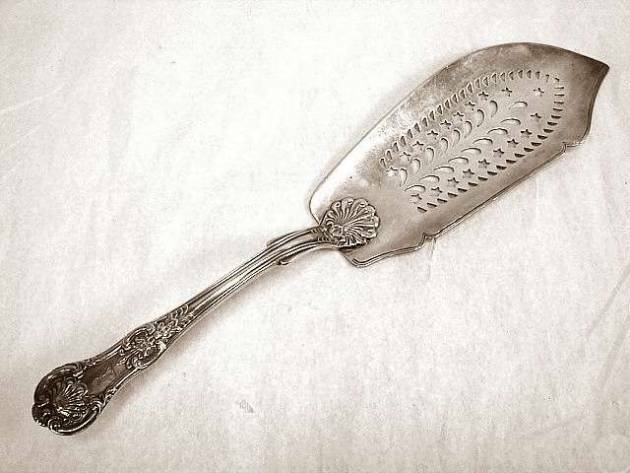 The earliest examples of fish slice were made c. 1735. They were shaped as a triangular pointed trowel, often with round corners with pierced decorations. Their use was to drain and serve small fishes directly from the pan. 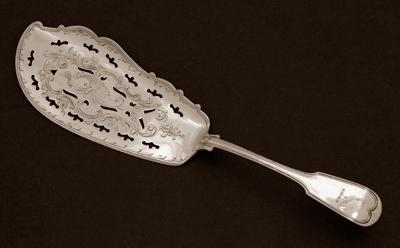 After c. 1745 the outline became symmetrically elliptical as they were used to separate and serve portions of a larger fish. Later examples changed to asymmetrical shape with one blunt and undulating edge rising to a point nearly midway, while the other edge was convex and sharp. 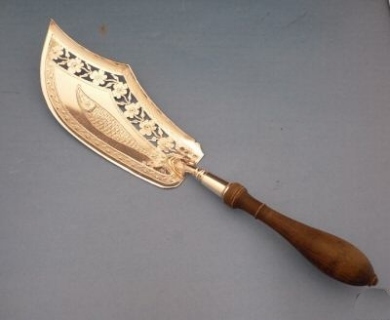 The scimitar blade was introduced c. 1780 and was highly popular until c. 1800. Often a wide piercing covered the blade, presenting examples in baroque or rococo style where the removed metal was more than that retained. The piercing was often enhanced by bright-cutting, with one or more fish forming a central motif. Saw-piercing was the method employed when they first appeared and continued to be used throughout the eighteenth and nineteenth centuries, but in the late 1760s was introduced the mechanical die fly-cutting using steam-driven equipments. The fly-punching was of great advantage in the manufacture of Old Sheffield Plate blades as the gradual squeezing out of the metal under the piercing tool had the effect of dragging down with it the surface of the silver, and so at the same time covering up the raw edges of the copper that otherwise with the saw piercing must have become exposed.